Born on the day Ron "Pig Pen" McKernan of the Grateful Dead died, McVay has published in more than 50 magazines and several anthologies, most recently Letters to the World: Poems from the WOM-PO Listserv (ed. Moira Richards, Red Hen Press). After her debut chapbook, Brother Ikon (Inkstone Press, 1997), she went on to become one of Pecan Grove Press's shortest female authors with her second chapbook, This Natural History (1998) and her first full-length collection, Ordinary Beans (2007). Gwyn McVay is a LibraryThing Author, an author who lists their personal library on LibraryThing. 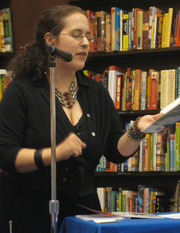 Gwyn McVay is currently considered a "single author." If one or more works are by a distinct, homonymous authors, go ahead and split the author. Gwyn McVay is composed of 1 name.